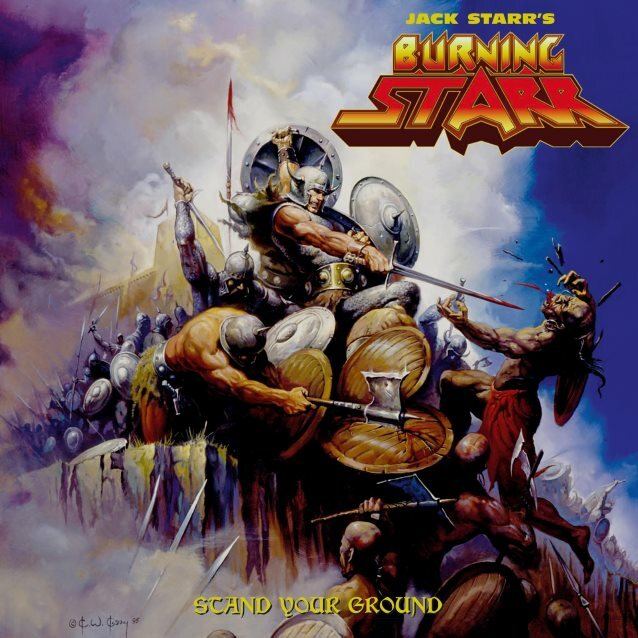 “Stand Your Ground” is the seventh studio album from Power Metal group Jack Starr’s Burning Starr and is to be released August 25th, 2017 via High Roller Records. If I am being honest I am sorta new to the band as up to this point I had heard only four albums from them. However, from what i have heard this band is a powerhouse and a must if you are a fan of Power Metal in general. Jack Starr himself has a reputation also being in Virgin Steele prior to forming Burning Starr in the mid 80’s and is a hugely underrated guitarist as well. So here we are with a release six years after their last album, does it stack up against their solid discography or does it fall flat? 1.Secrets We Hide- Opening with some great solid drum rolls by Kenny “Rhino” Earl, this song hits hard right out of the gate with a solid upbeat power metal riff and one of my all time vocalists today Todd Michael Hall really belting it out. His voice is just as strong as some of the greats in Heavy Metal history. The chorus is a big stand out and is definitely made for a live crowd with how catchy it is. The solo works very well being equally heavy and melodic showing off Starrs capabilities and that he really still has a solid lead tone. Overall, this is a grad A power metal opener for the album. 2.The Enemy-The beginning of this song almost sounds like an old school slayer riff but goes into a straight melodic galloping rampage. This is one of my favorites on the album really for the sheer power it packs and I feel that has something partially to do with how well the production is on the album. It feels very live and natural with a lot of bass mixed with the drums it just sounds so organic. The chorus is full of so much melody it soars and is very infectious. Another total barn burner of a song that packs a lot of punch. 3.Stand Your Ground- Damn this is quite an epic song being over ten minutes long. It definitely never lets up with a lot of cool melodic riffs that adds a lot of character to the song. The chorus goes for more of a melodic fist pumping mid tempo that i cant help but sing to even three listens through. The solo is probably my favorite on the album with Starr going all out for this song. Overall, this is definitely one of the best on the album with band showing a bit of a progressive side that definitely feels very original. 4.Hero-The main riff for this song is very interesting. It definitely has a progressive metal feel to it until the verses start with a traditional galloping to it. The song definitely has character and works very well for what its going for. As for the chorus, this song has one of the best on the album it just screams classic to me. This is another great song that deserves multiple spins. 5.Destiny- I almost get a more modern feeling when this song began and almost a bit of a hard rock edge as well. This song sticks to a more mid tempo and up beat chord progression and it works and is one of those songs you just play as loud as you can. This is another track that would work very well live. The hooks are just all over this song. One of the most melodic and infectious songs on the album. 6.The Sky Is Falling-This is another very epic tune that sticks to a similar tempo as the last but has a bit more chugging guitar in it. The bridge to the chorus feels a bit disjointed here or lacking a bit of power but once it gets to the actually chorus it works very well. The solo or the song is actually very well done as well. Compared to the last five songs this one falls a bit flat in parts but overall it isn’t an overly badly written track. 7.Worlds Apart- This song is definitely more ballad like than any of the last but those leads are great and have a lot of feeling in them. I really like this song because it gives off a great melodic and soft yet heavy atmosphere. The guitar soloing is definitely the biggest highlight overall for how much feeling they have any deserve a lot of repeat listens and show how well of a player Jack Starr is. 8.Escape From The Night-This track has a great build at the beginning and goes into a more maiden-esque kind of gallop but still retains a more power metal feel with Hall’s vocals still holding up well and fresh this far into the album. I really enjoy the epic chorus here as well. This is definitely one of the best mid tempo songs on the album. 9.We Are One- This is another softer song on the album which shows more variety throughout the record….well it opens that way. This song caught me off guard as it goes into of this almost Gothic sounding power metal kind of song with some almost ominous riffing that takes repeat listens to really get a grip on. I wasn’t sure why but it helped me understand the chord progression more. This is definitely one of the most unique songs on the album just for the interesting sound it has with almost these subtle little note changes that catch you off guard at least on the first listen. It definitely isn’t bad though as it still packs a lot of power and melody throughout. 10.Stronger Than Steel- This song goes for more of that traditional faster power metal feel and is my favorite track on the album overall. the pacing is solid and the chorus is definitely the highlight on the album. It is just pure old school fist pumping heavy metal. Another reason it is one of my favorites on the album is that it includes a very interesting guest vocalist(sorta). Rhett Forresters old demo vocals are included on the track which is one of the coolest inclusions on any record ive ever seen. Rhett Forrester was always my favorite vocalist for Riot and to hear a tribute to him here is amazing and just makes the song even more worth it. Even if it is very rough and is included at the very end its very cool. 11.False Gods- This is one of the heaviest tunes on the album with a lot chugging guitars through the verses leading into a monumental chorus. This song is very well done especially this far into the album, it doesn’t feel forced or generic. A very solid headbanging track. 12.To The Ends- The final song on the album and it ends in true power metal fashion with a very infectious mid tempo riff and soaring song a long vocals. This is a very solid closer that I would hope the band plays live because this song is another that is meant for crowd participation. It does sort of go by the books but the band really put their heart into it with Starr adding some nice melodic guitar solo’s in to make it feel more original. Overall a pretty solid closer to the album. Overall, I give the album a solid 8 out of 10. While the middle of the album does fall a bit slow, the original that the band put into writing these songs cannot be denied. They definitely put their all into the playing on this album. Every member sounds like they are really giving it their all and have created a very modern power metal album that will satisfy the old school and new school crowds alike. I definitely recommend this album as it will definitely make my top 10 for the year and once i get my hands on the vinyl edition, it’l definitely be on the turntable quite a bit.